The new DLC The Witcher 3 Blood and Wine added some new and pretty awesome armor sets and weapons to the game. 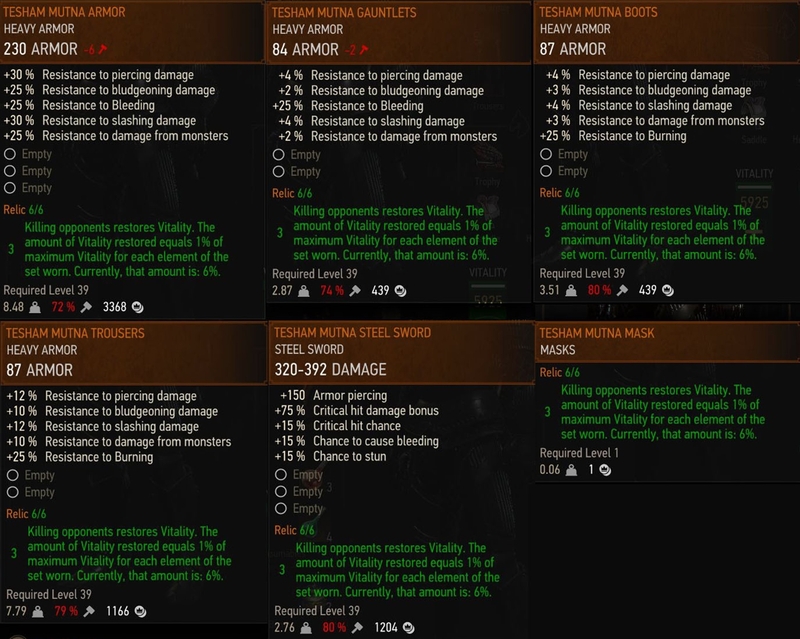 Tesham Mutna Armor is a heavy armor set and requires players to have 39 character level to actually equip it. Only wearing just 3 pieces of this Tesham Mutna Armor gives you vampire aura that allows you to heal yourself by taking down enemies. In The Witcher 3 Blood and Wine Tesham Mutna Armor guide we will show you the location of all the pieces of Tesham Mutna Armor in Blood and Wine expansion pack. 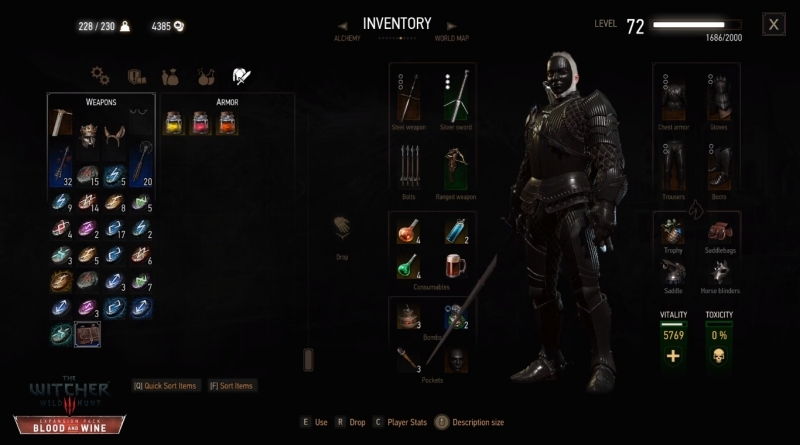 In this very guide, we will also provide you the stats of this armor set and how it looks on Geralt. All pieces of Tesham Mutna Armor can be found in Tesham Mutna Ruins which is located in southern part of the map. If you do not know where it is, do not worry because the main story quest ‘La Cage Au Fou’ will take you there. You can easily pick all 6 pieces when you follow Regis in the dungeons. When you enter the building and walk down the circular stairwell, you can see Regis leaning on a chest next to a door. Loot this chest to find steel sword, the armor and trousers. After walking down the stairs that are next to some hanging cages, loot the chest close to the door. This chest has the boots and mask. The last piece of this armor, gauntlets, can be found in the corridor with many cells. Just Look for the strongbox on the shelf in a wall, after the second cell on the left side. Tesham Mutna Armor is a heavy armor that provides a player with great protection. Apart from slashing, high piercing, monster damage and bludgeoning resistances (25 – 30% each just from a chest piece alone), each piece of this armor grants 25% protection from a more particular form of damage such as bleeding or burning. If you wear just 3 pieces of this armor it will provide you restoring health ability by killing enemies. The restored amount of health is 1% of the max vitality for each piece you are wearing, with the maximum of 6%. Watch this short video to find the exact location of Tesham Mutna Armor pieces.